Are you experiencing a regular need to urinate and not able to do a steady stream when you do go? You may have a prostate problem. Do pay your GP a visit and consider a natural remedy from Aloe Ferox. 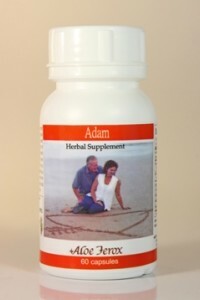 Adam from Aloe Ferox is a natural herbal supplement for male wellbeing. It is a powerful formulation of carefully selected botanicals to address the issue. Adam contains; Muira Puma, Saw Palmetto, L-Argin, Zinc and Aloe Ferox. Muira Puma, a revered rain forest botanical used by indigenous people to increase sexual desire, libido and sexual performance. Saw Palmetto has been used for at least 200 years for the symptomatic relief of mild and benign prostate problems. L-Argin has been shown to improve blood flow to the prostate that assists with urinary and sexual function. Similarily Ginkgo Biloba also improves blood flow which can help stimulate and maintain an erection. This product is not intended to diagnose, treat, cure or prevent any disease and if you experience a change in your function you should, must, consult your doctor.